Fishing for trollers and bait fishers has again been very good over the weekend. 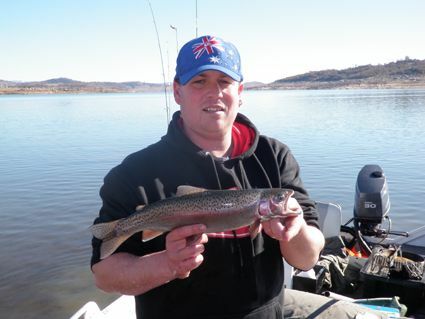 Flyfishing reports have been scarce but there will be som very good fishing in Jindabyne coming up as the lake continues to rise. Lake Eucumbene:- Fly reports have been quiet though there are fish to be caught in many areas. You do have to actually go fishing to catch them. Suggest nymphs and olive streamers fished slow on the rainbows and if polaroiding a brown or two small nymphs or small streamers in sz 10. *Jay and the boys had another good time on the weekend with some more nice fish on the troll out of Buckenderra. Dan caught this nice rainbow too. Trolled around East Jindabyne on Friday, and my friend Nick got this brown on a pink dual-depth Tassie. *Jason Mcpherson and Andrew Lemmey had a good session in Eucumbene on the weekend catching ten fish between them. Nine rainbows and one brown were landed on Powerbait with Jason catching the 2.6kg brown picuted below.